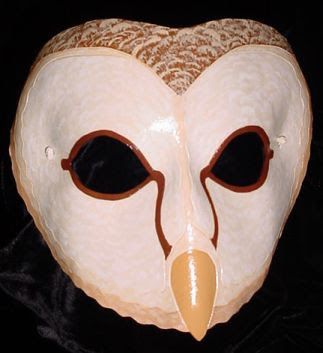 With something as outlandish as what has been percolating in my head, concerning the mask to accompany the barn owl ensemble, I feel it necessary to put as much planning, forethought, and research into it as possible. 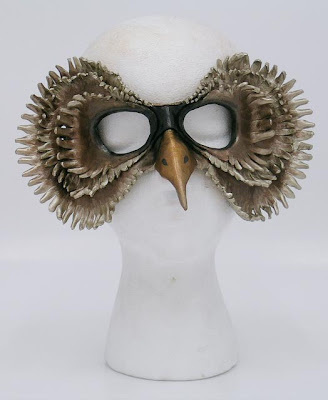 I ran another search for owl masks to see what the rest of the world has done, and came up with quite a few images of some really fantastic examples. 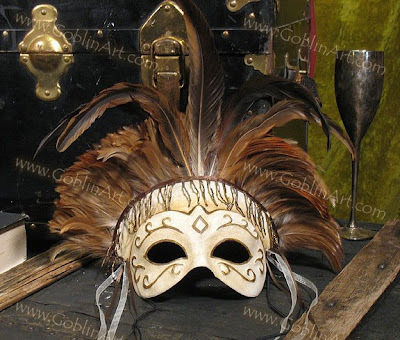 Some are actually quite simple, some incredibly complex, and some aren't even "masks" but makeup! 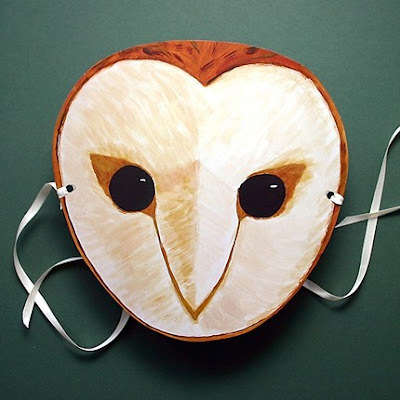 I have found masks made from paper mache, leather, wood, metal, and plastic. 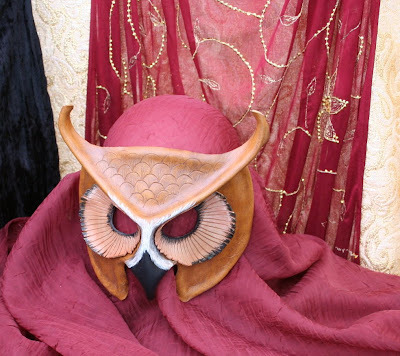 I've decided on paper mache for my go at it, as it is a breathable material, easily sculpted, and inexpensive. 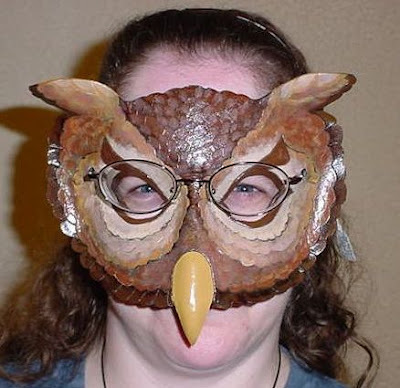 I intend to wear the mask all night (or for as long as I can), so I will need something with the utmost comfort. 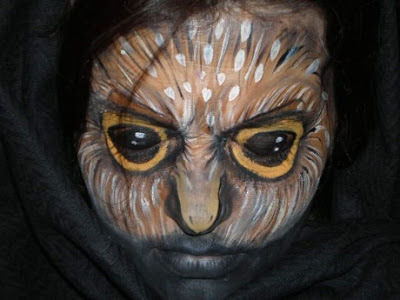 This is facepaint! I believe the model's eyes are closed. I wonder how it would look with the eyes open. 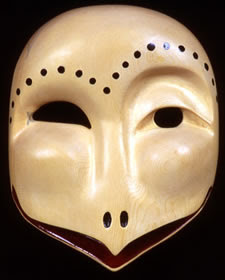 This one is carved from wood, and very stylized. Very coo. These two are so simple, but so lovely. This fellow (GoblinArt.com) does incredible paper mache work, as you can see. I found a tutorial online by him, talking about his unique method. I think I will give it a try and be persistent in trying to acheive this level of finish. 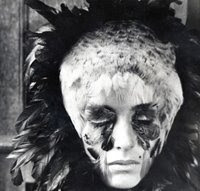 I wanted to know more about this image, but all I could find out was that the feathers have been applied to her face, like prosthetics. I think the top part is some kind of cap. Pretty amazing stuff, huh? 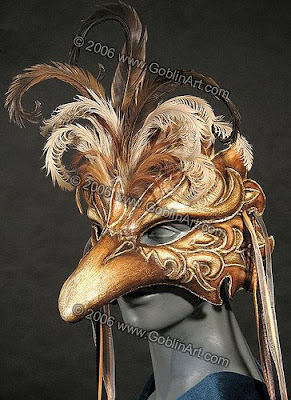 I'm not against doing some kind of feather makeup thing, if I can figure out how to do it - it is Halloween, afterall!